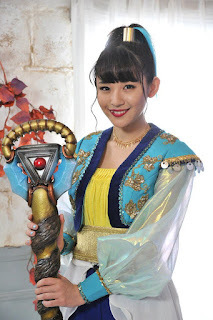 Actress Nana Asakawa has been announced to be part of the 4-part mini series. Nana Asakawa plays the role of the mysterious Rita, who summons 5 veteran Super Sentai heroes to participate in the Strongest Battle. Nana Asakawa was a member of the idol group SUPER☆GiRLS from 2012 to 2019. This is her first project after graduating from the group. She is also a popular gravure model, and has had acting roles in movies and TV, such as the TV drama and film "Rikei ga Koi ni Ochita no de Shoumei shita", alongside Shun Nishime of Kamen Rider Ghost as her leading man.